Eleanor Baxter was the eldest, unmarried, daughter of William Baxter of Balgavies, sister of Sir David Baxter and Mary Ann Baxter. With them, she donated Baxter Park to the city in 1863, otherwise living quietly in the family home in Dundee. Miss Baxter was a member of Ward Chapel, Dundee, of the Congregational Church. She is named on the Congregational Roll as 'Helen' (see comments). Eleanor Baxter (baptismal name Helen), was the daughter of Elizabeth Gorrell (1763-84) and William Baxter (1767-1854). Her father set up a steam powered flax spinning mill at Lower Dens Works in Dundee in 1822, operating as William Baxter and Sons (later Baxter Brothers). Eleanor was the eldest of eight children, followed by Edward ( 1791-1871), Margaret (1794-1845), David (1793-1872), John Gorrell (1796-1853), William Gorrell (1798-1852), Mary Ann (1801-1884), and (Elizabeth 1802-1883). Eleanor’s baptismal name was Helen and she also appears as ‘Ellen’ in Baxter genealogy. Such variations were fairly commonplace, and the names Elinor and Eleanor came into vogue with the publication of Jane Austen’s Sense and Sensibility in 1811, after its heroine. We can only speculate whether this fashion influenced her chosen forename. Unlike her sister, the philanthropist Mary Ann Baxter, Eleanor rarely ventured into social action in the public sphere. Her most notable involvement with civic life in Dundee occurred in 1863, when she, together with Mary Ann Baxter and David Baxter, gifted Baxter Park to the City. The Baxters donated 36 acres for a public park, designed by Sir Joseph Paxton, intended to provide mill workers with a green space for recreation in the industrial city. 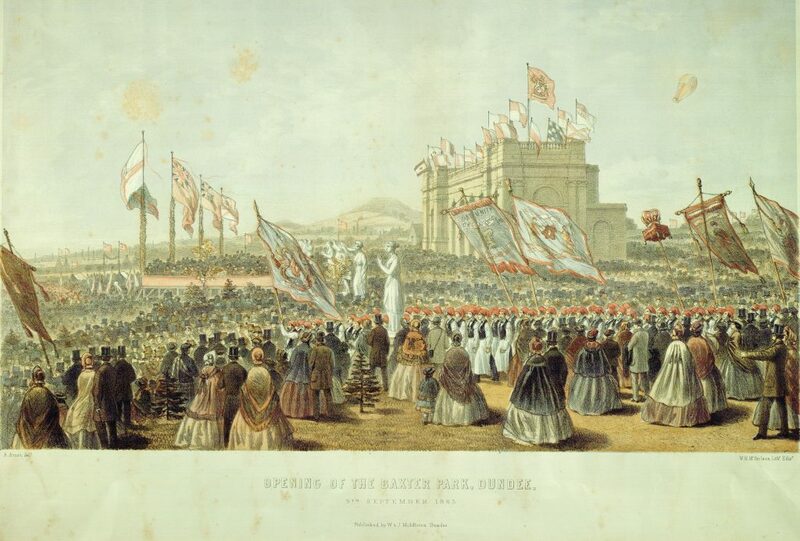 The opening of Baxter Park on 9 September 1863 by Earl Russell was a grand civic occasion, with workers’ processions, a presentation of the Deed of Gift to the Baxters, and the unveiling of a statue to the newly knighted Sir David Baxter. 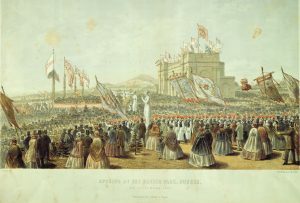 An estimated 70-80,000 Dundonians attended the opening (roughly three quarters of the population), and the Dundee Advertiser recorded the generosity of Sir David and ‘the Misses Baxters, his kind-hearted sisters’. Otherwise, as the unmarried daughter of a wealthy middle class family, Eleanor Baxter appears to have lived a retired life in the family home at Ellengowan, in Dundee. It can be surmised that like similar spinsters she was involved in the care of her elderly father, or other family members. This cannot be confirmed, since Eleanor left no personal records. She is, however, recorded as a member of the Congregational Ward Chapel, with her father, sister Mary Ann and brothers, a church which acquired a fashionable reputation from its upwardly mobile congregation, and carriages at the door. Eleanor died in 1868, aged 80, from Bright’s disease, a kidney complaint described as ‘of long standing’, so she may have lived out her final years as an invalid. 'Address and Acknowledgement to Sir David and the Misses Baxters, 28 October 1863'. Minute Book 1 of the Baxter Park Trustees. p.326. McGraw, Ian (2002). Victorian Dundee at Worship. Dundee. Abertay Historical Society, no.41. pp19-20. The reputation originated in the previous Congregational Chapel, in Temple Lane, where Miss Baxter had a sitting from the 1820s. Feature image, 'The Opening of Baxter Park, courtesy of Libraries, Leisure and Culture, Dundee. The information above about Eleanor Baxter has been collated from a range of digital and hard copy sources. To the best of our knowledge it is correct but if you are relying on any information from our website for the purpose of your own research we would advise you to follow up the sources to your own satisfaction. If you are aware of an inaccuracy in our text please do not hesitate to notify us through our Contact page.